[modifiers] can be either new, public, protected, internal, private, sealed, static (new in C# 2.0) or abstract. The new modifier is only permitted on nested classes and it specifies that the class hides an inherited member by the same name. It is a compile-time error for the new keyword to appear in a class declaration. The remaining modifiers control the accessibility of the class. Depending on the context in which the class was defined, some of these remaining access modifiers may not be permitted. For example, a class declared within a namespace must be wither public or internal. Finally, The [base-list] is usually zero or one base class and zero or more interfaces. An abstract class is one that cannot be instantiated directly via new. An abstract class can contain member methods that can be either abstract or non-abstract. When a non-abstract class inherits from an abstract base class, the non-abstract class must implement all of the inherited abstract members of the abstract base class by overriding them. An abstract class cannot be sealed. // Must provide implementation of all abstract members of an abstract class. An abstract class is closely related to an interface in the sense that both declare a 'contract' that must be adhered to by clients. See interface for more info. If a class declaration has no base class, or if the class only derives from interfaces, then the direct base class is assumed to be object. The set of base classes of a class type is the transitive closure of the direct base class relationship. In the above example, the base classes of class type B is A and object. The direct base class of a class type must not be any of the following: System.Array, Sysem.Delegate, System.Enum, or System.ValueType. Every class has exactly one direct base class. Except the object class which has no direct base class and is the ultimate base class of all other classes. A class directly depends on its direct base class, and directly depends on a class within which it is immediately nested (if any). Therefore, the complete set of classes upon which a class depends is the transitive closure of the "directly depends on" relationships. A class can be declared static indicating that it only contains static member. It is not possible to create instances of static classes with the new keyword. Static classes are loaded automatically by the .NET Framework when the program or the namespace containing the class is loaded. In fact a static class is similar to a normal class with static members and private constructors. They only contain static members. They are sealed and cannot be inherited. They cannot contain instance constructors (although they can contains static constructors to assign values or set up some static state). Represent constant values within the class. Represent variables of the class. Represent computations and actions performed by the class. Represent named characteristics used to read/write those characteristics. Represent notifications that can be generated by the class. Permit instances of classes to be indexed in the same way as arrays. Define which expression operators can be applied to instances of classes. Implement clean-up actions before an instance is permanently discarded from memory. Represent types that are local to a class. Inheritance means that a class implicitly contains all members of its direct base class, except for instance constructors, destructors, and static constructors of the base class. A class is permitted to declare a member with the same name or signature as an inherited member. When this occurs, the derived class member is said to hide the base class member. Derived class can hide inherited members by declaring new members with the same name or signature. Note that hiding a member does not remove it - hiding only makes the hidden member inaccessible form the derived class. Because only public inheritance is allowed in C#, the is-a relation ship always holds true. Therefore, if class Student derived from class Person, then public inheritance means that Student is-a Person, and hence any code that expects an instance of Student can be passed an instance of Person, because Student is-a Person. This also implies that an instance of Student can always be treated as instance of Person. Virtual methods, properties and indexers enable polymorphic behavior wherein actions performed by the overridden versions of these virtual members will vary depending on the run-time type of the instance through which the member function is invoked. Can inherit from one base class only. However, a C# class is free to inherit from more than one interface. Can only be created using the new operator. A static field identifies only one storage location. No matter how many instances of a class are created, there will always be one copy. A static function member does not operate on a specific instance. Therefore, it is a compile-time error to refer to this in such a function. A nested type declared with a class can have any of the five forms of declared accessibility: public, protected internal, protected, internal, private, and like other class members defaults to private. Recall that non-nested types can have public or internal declared accessibility only. However, a nested type declared within a struct can have only public, internal, or private declared accessibility, and like other struct members defaults to private. Also note that a nested type and its containing type do not have a special relationship with respect to this. Specifically, this within a nested type cannot be used to refer to an instance of the containing type. If the nested type needs to access instance members of its containing type, it can do so through by having a constructor or other property that takes the this variable of the containing class. Note that a constant with a class is semantically equivalent to a static member in the sense that each class instance will get the same value for that constant. However, a constant neither requires nor allows the static keyword to be supplied. A constant-expression is an expression that can be fully computed at compile-time. Note that because the new operator is not allowed in a constant-expression, and because the only way to create a non-null value of a reference type (other than string) is to use new, then the only possible values for constants of reference types (other than string) is null. If a field is not initialized, the initial value of a field whether it is a static field or an instance field is the default value of the field's type. This initialization happens when the program is run by having the memory manager initialize field memory to all-bits-zero before it is allocated for use. for static fields this initialization correspond to an assignment statement that is executed at an implementation-dependent time prior to the static constructor of the class (if any) and prior to the first use of a static field of that class. for instance fields this initialization correspond to an assignment statement that is executed during class instantiation using any of the instance constructors. A static field is not part of a specific instance; instead it identifies exactly one storage location no matter how many instances of the containing class are created. An instance field (not qualified with static) on the other hand belongs to an instance; there is a separate memory location in each class instance. See Static and Instance Members for more details. These fields can be initialized during declaration or in an instance constructor. These fields can be initialized during declaration or in an static constructor. readonly instance fields are specific to each instance. However, static readonly fields are not specific to any instance as their value will be shared by all instances. static readonly fields are semantically similar to constants, so when do you use which? A static readonly field is useful when a symbolic name for a constant value is required, but when the type of the value is not permitted in a const declaration. A static readonly field is useful when the value cannot be computed at compile-time. A read of a volatile field is called a volatile read - it is guaranteed to occur prior to any references to memory that occur after it in the instruction sequence. A write of a volatile field is called a volatile write - it is guaranteed to occur after any memory references prior to the write instruction in the instruction sequence. These instructions ensure that all threads will observe volatile writes performed by any other thread in the order they were performed. For abstract and extern modifiers, the method body should consist of a semi-colon. For all others, the method body consist of a block which specifies the statements to be executed. The signature of a method consists of the method's name and type and kind (value, reference, output) of each of its format parameters. Note that the signature of a method does not specifically include the return type not does it include the params modifier that may be specified for the right-most parameters. A parameter declared with no modifiers is a value parameter. A value parameter corresponds to a variable local to the function that gets its initial value for the corresponding argument supplied in the method invocation. Any changes to value parameters affect the local storage area only and have no effect on the actual argument given to the method invocation. In other words, changes to value parameters within the function body are not reflected back to the caller. A parameter declared with the ref keyword is a reference parameter. Unlike a value parameters, a reference parameter does not create a new local storage location. Instead, a reference parameter has the same storage location as the variable given as the argument in the method invocation. This means that any changes to the parameter in the method will be reflected back in the caller. Variables representing reference parameters must always be assigned before using them in a method invocation. The method invocation must also supply the ref keyword for any variable representing a reference parameter. Also note that an overload will result if two methods differ only in their use of ref. A parameter declared with the out keyword is output parameter. Similar to a reference parameters, an output parameter has the same storage location as the variable given as the argument in the method invocation. This means that any changes to the parameter in the method will be reflected back in the caller. out parameters are particularly useful when you want a method to have multiple return values, as any given method can have zero, one, or more out parameters. Variables representing out parameters do not need to be assigned before using them in a method invocation. The method invocation must also supply the out keyword for any variable representing an output parameter. Within the method, an output parameter is considered unassigned and must be assigned before its value can be used. Also note that an overload will result if two methods differ only in their use of out. // created array instance as the actual argument. .NET types can either be passed by-value or by-reference. Passing a value type by- value. Passing a value type by- reference. Use the ref or out keywords. Passing a reference type by- value. Passing a reference type by- reference. Use the ref or out keywords. Passing any type by-value to a function member means that the the function member will be working with a copy, and hence changes to the variable will not be seen by the caller. Passing any type by-reference to a function member means that the the function member will be working on the same location as the passed variable, and hence changes to the variable will be seen by the caller. The default for passing value-types is by-value. This means that a copy of the actual data will be passed and changes to the copy will not be seen by the caller. The default for passing reference-types is also by-value. This means that a copy of the reference will be passed. This further means that changes to the underlying data pointed to by the reference will be seen by the caller, however, changes to the reference itself, i.e., re-assigning the parameter to a different memory location works only inside the method and does not affect the original variable. Passing a reference type by-reference means that the actual reference itself will be passed. This implies two things: Changes to the underlying data will be seen by the caller, and changes to the reference (i.e., re-allocating the variable) will also be seen by the caller. A new local storage location is created in the method, hence a copy of the data is used. Changes to this value in the method are not seen by the caller. The function uses the same storage location as used by the original caller. All changes to the variable will be seen by the caller. A new local storage location is created in the method, hence a copy of the reference is used. Changes in the method to the data pointed-to by the reference variable are seen by the caller. Changes to the reference itself (i.e., re-assigning or changing the memory location) are not reflected back to the caller. All changes to the variable will be seen by the caller. This means that the underlying data as well as the memory location itself can be re-assigned/changed. obPP.PassReferenceTypeByValue( str1 ); // str1 = "Hello"
obPP.PassReferenceTypeByReference( ref str2 ); // str2 = "World"
When a method declaration includes the static keyword, the method is said to be a static method. When no static modifier is present, the method is said to be an instance method. Note that a static method does not operate on an instance and hence it is a compile-time error to use the this keyword inside a static function. However, an instance method operates on a specific instance and accessing the this keyword is allowed. A virtual method is a method declared with the virtual keyword. The implementation of a non-virtual method (a method without the virtual keyword) is invariant: the implementation will be the same whether the method is invoked on an instance of the class on which it is declared, or on an instance of a derived class. In contrast, the implementation of a virtual method can be superseded in derived classes. The process of superseding the implementation of an inherited virtual method is known as overriding. In a virtual method invocation, it is the run-time type of the instance that determines which method to invoke. In a non-virtual method invocation, it is the compile-time type of the instance that determines which method to invoke. // Call the overridden base method. Derived3 attempts to further specialize f() which was inherited from Derived2. However, Derived2 declared f() as a sealed override, and hence Derived3 attempts to override a sealed method. An abstract method declaration declaration introduces a new virtual method, but unlike a virtual method declaration, an abstract method declaration does not provide an implementation. Non-abstract derived classes are required to provide their own implementation by overriding the inherited abstract method. Whereas a a virtual method declaration does not require its derived classes to provide their own implementation since the derived classes inherit the default implementation of the base class virtual method. A property is a class member that provides access to a characteristic of an object or class. Examples of properties include size of a window, ID of a student, length of a string and so on. Properties are a natural extension of fields in that they provide a simple way for getting/setting property values, and at the same time, provide for a mechanism that associates actions/computations when getting/setting values. Even though the syntax for accessing a property is the same as accessing a variable, a property does not denote a variable. Therefore, it has no memory location and parameter modifiers out and ref cannot be used to pass properties as function arguments. Similar to fields and methods, a static property includes the static modifier and is not associated with a specific instance, while an instance property does not include the static modifier and is associated with a specific object instance. This "no-side effect" convention does not mean that the get accessor should always be written to return values stored in fields. In fact, get accessors often compute the value of a property by invoking multiple methods and accessing multiple fields. For example, a TransactionCount property on a data access object can be used to query the database for number of currently active transactions! Finally, note that exposing fields through properties is not any less efficient than exposing fields directly. In fact, when a property is non-virtual and contains a small amount of code, the execution environment may replace calls to accessors with the actual code of the accessors. This is known as in-lining and makes property access as efficient as field access. As known from interfaces, you cannot apply access modifiers on interface declaration or an explicit interface member implementation. You can use asymmetric accessors only if the property or indexer has both set and get accessors. In this case, the modifier is allowed on only one of the two accessors. If the property or indexer is an override, the accessor modifier must match the accessor of the overridden accessor, if any. The accessibility level on the accessor must be more restrictive than the accessibility level on the property or indexer itself. // The get accessor gets the accessibility level of the property itself (public). // As per interface declaration rules, no access modifier can be applied to the Name property. // Also no access modifier can be applied to the get accessor. A virtual property is one that is declared with the virtual keyword. The virtual keyword specifies that the current implementations of the accessors are virtual and that derived classes are free to specialize them using the override keyword. An abstract property on the other hand is one declared with the abstract keyword but does not provide an actual implementation of the accessors. Because abstract property declarations are only permitted on abstract classes, it is therefore, a requirement for non-abstract derived classes to provide their own implementation. This logic is the same as it is for virtual and abstract methods. A property declaration that includes both abstract and override modifiers specifies that the property is abstract and overrides a base virtual property. This results in a branch situation which was discussed in the methods section. When overriding properties, if the inherited property had a single accessor (i.e., read-only or write-only), the overriding property must only override that accessor. If the inherited property included both accessors, the overriding property can override either a single accessor or both of them. An overriding property may include the sealed keyword to indicate that this property may not be further specialized by derived classes. type is the delegate to which you want to associate this event and access-declarators are used to add and remove event handlers in client code. Note that just like methods, properties, and fields, an event can either be a static event (not associated with a specific instance), or it can be an instance event (associated with a specific instance). Classes: a broadcaster class that contains a delegate field and decides when to invoke the delegate, and a subscriber class that decides when to start/stop listening to the broadcaster by calling += and -= on the broadcaster's delegate. A subscriber does not know or interfere with other subscribers. Components: an event, a delegate and an event handler. An event is fired by the broadcaster in certain cases by simply calling the event. A delegate represents the signature of a callable entity (i.e., a function) that will be called by the event. An event handler is a client-side function whose signature must match that of the delegate and that will be called when the event fires. Code within Broadcaster class has full access to the PriceChanged event and can treat it as a delegate. Code outside Broadcaster can only perform += and -= operations on the PriceChanged event. The compiler looks within the Broadcaster class for references to PriceChanged that perform operations other than += or -= and redirects them to the underlying _priceChanged delegate field. The compiler translates += and -= operations on the event to calls to the event's add and remove accessors. Derive from System.EventArgs to convey information about the event. System.EventArgs class is a base class for conveying information about the event. The subclass typically exposes data as properties or read-only fields. The delegate must have a void return type. The delegate name must end with EventHandler. Define an event based on System.EventHandler<> delegate defined in step 2. Write a protected virtual method that fires the event. The name of the method must match the event name prefixed by On and accept a single argument derived from EventArgs. Note the use of the generic EventHandler<T> class. The non-generic EventHandler can be used when an event does not carry extra information. When the event accessors are merely relays for another class that is broadcasting the event. When the class exposes a large number of events, where most of the time very few subscribers exist. In this case, it is better to store the subscriber's delegate instance in a dictionary for better performance. When explicitly implementing an interface that declares an event. Unlike other class members, indexers do not have user-defined names. Even though the syntax for accessing an indexer element is the same as accessing an array variable, an indexer element is not specified as a variable, and therefore, it is not possible to pass an indexer element as a ref or out variable. The signature of an indexer consists of the number and type of its formal elements. The names of the formal parameter and type of the underlying element is not part of the indexer signature. And because indexers do not have user-defined names, indexers are only identified through their signature. An indexer is always an instance member and can never be static. An operator is a class member that defines what it means to apply an expression operator to an instance of a class. For example, if ob1 and ob2 are two objects, what does ob1 + ob2 mean? Or what does ob1++ mean? The definition of these operators (binary + in the first case, and unary increment in the second case) is defined by class operators. and many others (review MSDN). An operator declaration must include either extern and hence no function body, or both public and static modifiers. The parameters of an operator must all be value parameters. It is a compile-time error for an operator declaration to use ref or out parameters. It is not possible for an operator declared in a derived class to hide an operator declared in a base class, Therefore, the new keyword is never permitted on an operator. This is because operator declarations always require class to participate in the signature of the operator. Operator definition for ++ and -- must take a single parameter of type T and return T.
Operator definition for +,-, ! or ~ must take a single parameter of type T and return any type. Operator definition for true and false must take a single parameter of type T and return bool. S and T are different types. Either S or T is the class or struct type in which the conversion operator is declared. Neither S nor T is object or an interface-type. T is not a base-class of S, and S is not a base-class of T.
A conversion operator declaration introduces a user-define conversion. Implicit conversion occur in a variety of situation including function member invocation, cast expressions and assignments. Implicit conversion occur implicitly without having to specify a cast. Explicit conversion must occur in cast expressions, else a compile-time error is generated. Again, only use explicit conversion if the conversion can cause information to be lost or can throw an exception. Note that by eliminating unnecessary casts, implicit conversion can improve source code readability. However, because implicit conversions can occur without the programmer specifying them, care must be taken to prevent unpleasant surprises in the form of exception. Therefore, implicit conversions should never throw exceptions and should never lose information so that they can be used safely without the programmer worrying about it. If a conversion operator cannot meet these criteria, then it should be an explicit conversion operator. Conversion operators are not allowed to redefine a pre-defined conversion. Thus, a conversion operator is not allowed to convert from / to object because implicit and explicit conversion operators already exist between object and all other types. Conversion operators are also not allowed from or to an interface type. This ensures that a conversion to an interface type succeeds only in object being converted actually implements the interface type. The signature of a conversion operator consists of the source type and the target type only (this is the only class member for which the return type is part of the signature). This also means that implicit and explicit keywords are not part of the conversion operator signature. // It is up to us to define what operator true means for a Point class. Instance constructors are not inherited. Hence, a class has no instance constructors other than those defined in the class. If a class contains no instance constructor declaration, a default instructor (one that takes no parameter) is provided automatically. 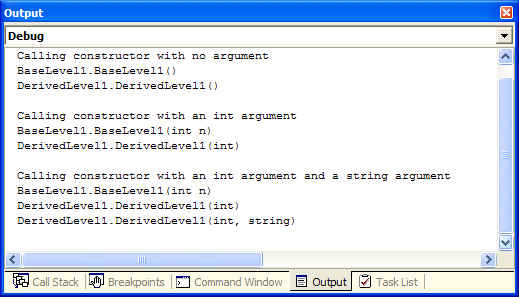 base( argument-list): causes the appropriate instance constructor of the direct-base-class to be invoked. this(argument-list) : causes the appropriate instance constructor from the containing class to be invoked. If an instance constructor has no constructor initializers, an instance constructor initializer of the form base() is automatically provided. This ensures that base class constructors are called as appropriate. The base constructor is called. The derived constructor is called. The class cannot be instantiated by clients. The class cannot be derived from. Recall that an instance constructor is a class member that implements actions required to initialized an instance of a class. A static constructor on the other hand is a class member that implements actions required to initialized a class. In other words, instance constructors initialize instances and static constructors initialize classes. The static constructor of a class executes before any instance of the class is created. The static constructor of a class executes before any of the static members of the class (if any) are referenced. The static constructor of a class executes after the static field initializers (if any) for the class. The static constructor of a class executes at most one time during the lifetime of a program. Destructors cannot be invoked directly. It is up to the garbage collector to decide when to invoke the destructor. What happens if an exception is thrown and not caught in a destructor? Destructor execution is terminated and the destructor of the base class is called. If there is no base class, the exception is discarded.